There’s constant discussion about how many seats airlines can stuff in. They all seem intent on shoving in one more across the aircraft or squeezing the ‘pitch,’ the distance between one row and the next, in order to get more passengers on board. But that’s back in economy which essentially doesn’t look any different today than it has any time in the past 30 or more years. ▲ Economy – and nothing but economy – in Ryanair on my recent trip to Turin. Economy is still usually just lots of people sitting shoulder to shoulder. We complain about how many people are crammed into the Boeing 737s and Airbus A320s used by the Low Cost Carriers (Southwest, Ryanair and so on), but it’s just as bad long haul. Airbus offer an A380 economy configuration which packs them in 11 across and the 787 Dreamliner is often not a dream at all when you see how many passengers some operators can squeeze into economy. At least in economy if you get a window seat you usually get a window to go with it. I love to look out, but far too often the seats in business and first are aligned so there’s no way you can look out the window. I’ve got off flights (Cathay one of the worst) with a stiff neck because the only way to look out the window is to kneel on the seat or twist your head around until it’s painful. In some cases this ‘align you away from the window’ game extends to making you stare at other passengers also aligned away from their windows. A recent Air New Zealand 747 was a particularly bad example of this misdesign and a Virgin Atlantic flight from London to New York was even worse. 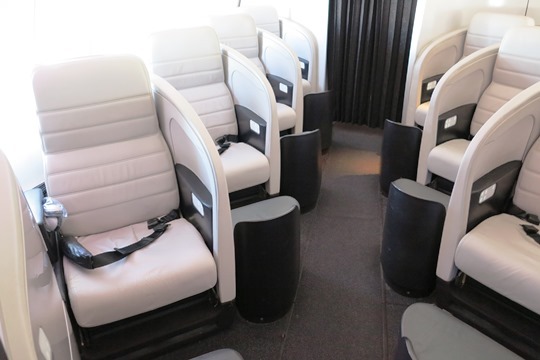 Cathay were also fond of these ‘herringbone’ seats, but now seem to be backtracking. The Air Map is often most interesting as you depart and arrive, but often (and again particularly at the sharp end of the aircraft) you’ve got a screen which has to be folded away at that time. Or they simply turn it off – Singapore Airlines are good at that. An honourable exception, the Qantas A380 with its hypnotic tail camera. Seats that reclined until they are an absolutely flat bed were a terrific invention – thank you British Airways who pioneered this idea. If you’ve got the money it’s the only way to fly. But now there’s a move to make the seat and the bed two different things, if you want to lie flat a flight attendant has to come along and reconfigure the damn thing. Singapore Airlines are particularly bad for this, but other airlines are following the same idea. Up at the sharp end Singapore Airlines seem to allow more space per seat than almost any other airline and then use it badly, I’m not a fan of their seating. The whole crazy idea of having a shower mid-flight! If you have any conscience you have to worry about the ethics of flying places. So then you add in a tankful of water to your personal weight because you can’t wait to get to the hotel or home to have a wash? That’s an Emirates invention. Patrick ‘Ask the Pilot’ Smith did a four airline business class comparison on his site recently: Qatar, Emirates, Singapore Airlines and Cathay. It makes an interesting read, but, spoiler alert, it’s Cathay that wins (and I’ve had good experiences with Cathay, I could agree with that) and Qatar that comes in last.